i cant believe someone noticed that, i wonder if gas station attendants are constantly on the vigil for counterfeit bills. if so, there is an incredible dearth of leisure in this fine northern state. Fake money has been a growing problem here actually. It's worse with the larger bills. 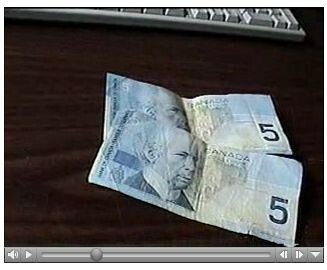 I had an usual experience with "counterfeit" money. One of our employee's came back from a convenient store saying, "I almost got arrested with this $100 dollar bill you paid me with." I took the bill to the bank and they marked it with a counterfeit pen. Sure enough, the mark turned black. So, they sent it off to the FBI in Atlanta, Georgia and it came back that the bill was real but it was like a 1952 and the new counterfeit pens wouldn't work on it. They wanted to give me a new bill for it but I told them, "...no, I want to keep this and frame it." So, my father has it in a frame along with the letter from the FBI stating that indeed, it's real.